It’s Back! What I’m Watching, Told Through Colo(u)r.
The new season of television is upon us here in the United States, and I have a little tradition that I must uphold. I know I am a little bit tardy in this, as many shows have premiered, so for those worried it might not make an appearance this year, never fear, the colo(ur) coded schedule is here! I create this calendar to organise the new shows that I want to check out each fall and to keep track of the returning shows. There are always shows that I check out once or twice that just fade away from my schedule, and I am sure this year won’t be different. This is either because they get cancelled, or they just don’t keep my interest. A couple interesting (to me at least) things to note about this year. My schedule feels very sparse this year, with only a few conflicts and even some open time slots. I am not sure if this is because I have learned to live with less television in my life or for other reasons. 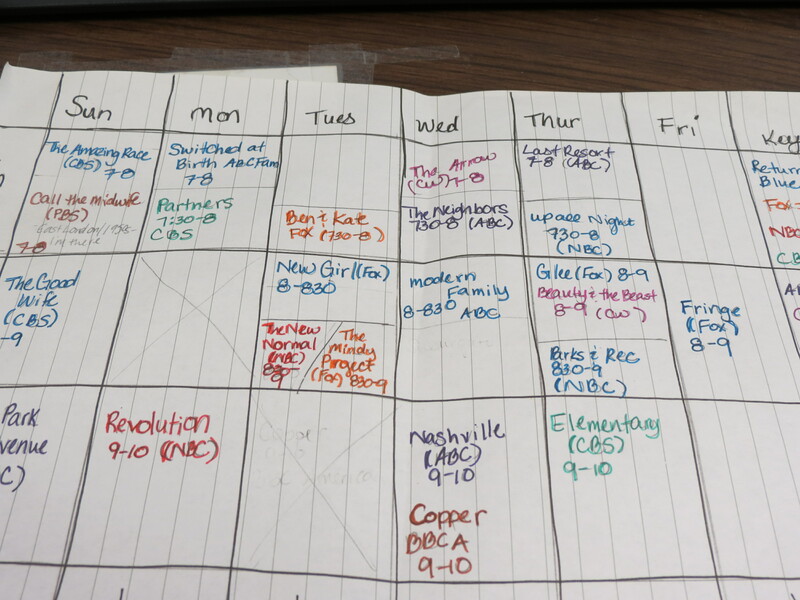 I have a pretty busy work schedule this semester and I know I won’t be able to keep up with a jam-packed slate. Or, it could be that it is simply a weak year for new shows. I expect that it is a mixture of all three, but I have to say, there were very few shows I felt really excited about. This schedule doesn’t reflect the many returning shows that I want to be watching (such as Boardwalk Empire or Homeland) that I have fallen behind on. As you may guess (or know) I have a difficult time not starting at the beginning . I am still working my way through Mad Men (and I will finish it so I can watch the next season live), so I am wary of taking on too much. So, I know there are good shows I am missing, but I can’t watch them all this year. 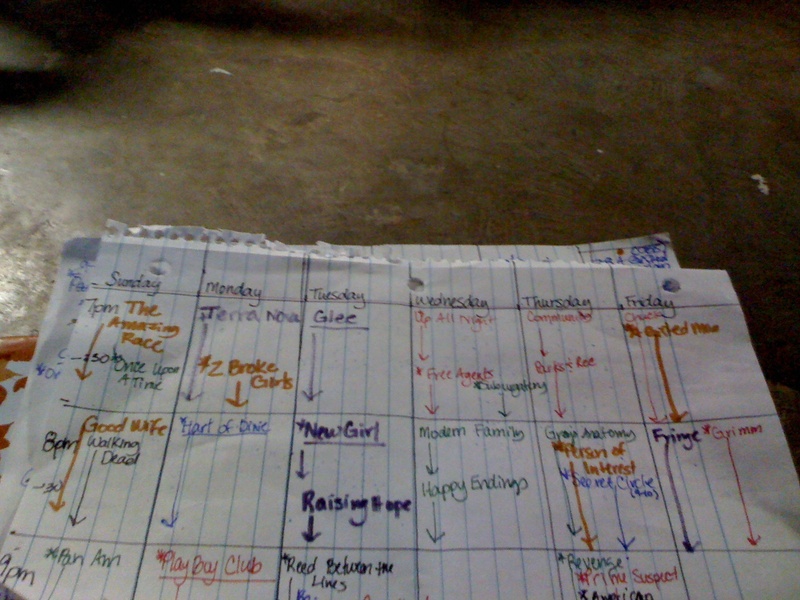 Here a quick rundown of the shows this one girl is watching this fall, after the break. 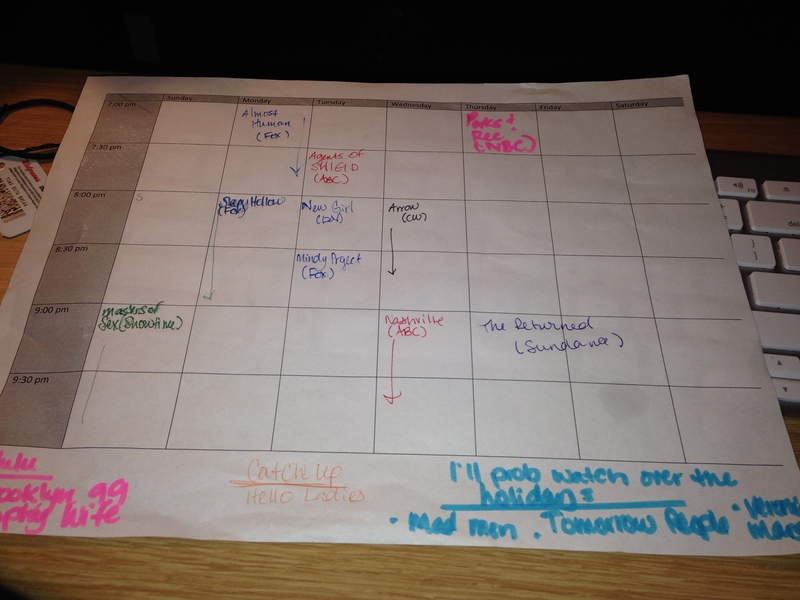 Below I’ve highlighted all the new and some returning shows I will be checking out in the next couple of weeks. Maybe someday I’ll get preview screens, and then I promise to cover all new shows! Fairy tale characters get cast out into the real world and can’t remember they are fairy tale characters. A Ginnifer and a Jennifer (Goodwin and Morrison, respectively) star, and you’ll probably get them confused. But it’s a little bit sci-fi/fantasy and therefore I will watch it. Christina Ricci and some others star as airline attendants, back when they were called stewardesses, for the airline giant of the 1960s Pan Am. Based (loosely) on true stories this looks like vintage fun. Jurassic Park crossed with sci-fi: A group of people from a dystopian future travel back in time to save humanity-as long as the dinosaurs don’t kill them. This basically looks like the tv version of Sweet Home Alabama. Which kinda sucked. The only reason it’s getting a look is because of Josh Schwartz of Chuck and The O.C. (don’t call it that) fame. It’s on notice because it looks stupid. Glee is getting a few episodes to see if it can start telling stories that aren’t offensive to women, people of color, and people with a disability. Also, if a character could show some development and then you know stay developed, Quinn! If it does none of this, I’ll have my sister tell me what happened. Because, I can’t quite quit it, but it is on notice! Look, I don’t mind Emily Deschanel’s sister. I think she’s cute, I like She & Him, and I think she acts okay. But I am not a fan of: Manic Pixie Dream Girls, Faux Dorks, girls who have ‘only guy friends,’ and twee and quirky for the sake of it. I’m afraid this show is going to be more of the things I’m not a fan of and less of Zooey just hanging out with some friends. So, it’s on notice. Perhaps this is 21st Century version of the Cosby Show, that stars Theo Huxtable and the star of Girlfriends. One of the few shows this season to have more than one minority staring in it, and I’m hoping it can live up to the Cosby Show comparison. Buffy, ahem Sarah Michelle Gellar, makes her long awaited television return in a dual role as twins Siobhan and Bridget. I don’t want to spoil too much, but let’s just say Bridget starts living Siobhan’s life, where she is married to Horatio Hornblower. (Who I called dibbs on back when he played this role). G.O.B. plays a new father and stay-at-home Dad? Christina Applegate is his tv producer wife? Maya Rudolph is an Oprah/Ellen hybrid of funny? Come on! You know I’m there. And the first episode was pretty funny too. Jeremy Sisto has been one of my tv boyfriends for a while, and Suburgatory makes him a single Dad. So, I am def. going to check it out. I do hope they break away from the traditional(ly boring) formula of talking about how cool those from NYC are and how very provincial anyone else is. ‘Cause that will get old. I can’t wait! Full Stop. It’s from J.J. Abrams so that’s all I need. You might want to know that Ben Linus (sadly without John Locke) and Jesus also star, or that it presumably full of twisty, sci-fi plots to get to watch. I only hope that this time, there really is an end-game. So it’s about a girl who discovers she’s a witch, from a line of witches. She moves to a small town with a bunch of other teenage witches. Gale Harold from Queer as Folk plays a really creepy magical person. Yes, I’ve pretty much been down this witchy road before (and before). Basically witches are usually in play when I watch crappy tv. Proof that sometimes fan campaigns work, Chuck is entering its final season, which is its fifth. Go to Subway and remember your power! As you may have figured out by now, I am a sucker for a fantasy/magical/sci-fi story, especially when it stars Patrick Wilson and Elizabeth Bennett (BBC-style). Like Medium and Ghost Whisperer, a character can see a ghost. Unlike those, this time it is a boy! Also, he may only be able to see his dead ex-wife (that’s Elizabeth Bennett,) I’m not sure. Anyway, this is on opposite Chuck, so I’m not sure how long I’ll stick with it, but definitely worth me checking out. One of the shows I’m most anticipating the return of, Fringe has really developed into a great truly science-fiction show. Last season took a bold step in the finale by proclaiming that Peter Bishop never existed. Producers have promised it’s not a reboot (an over-used word these days), but a new look at old stories. In what is likely its finale season, let’s hope Fringe goes out with a bang. And don’t worry, Joshua Jackson is still part of Fringe.